Trotman told Kaieteur News that The Commonwealth of Nations and the Organization of American States (OAS) have indicated willingness to aid in putting an end to the political impasse. The political atmosphere became intense this year after the Alliance For Change (AFC) alleged that the People’s Progressive Party (PPP) administration overstepped its boundaries in spending over $4B without parliamentary approval and tabled a No-Confidence Motion in the National Assembly. On November 10, President Ramotar, in an effort to avoid the No-Confidence Motion, prorogued Parliament with the hope that he could have somehow convinced the opposition to change course. However, the Opposition has refused to engage in dialogue with the government during this time of prorogation, and so everything remains at a standstill. The prorogation, which attracted worldwide attention, was almost a month ago, but nothing has changed so OAS and the Commonwealth now wants to see how best they can intervene in the best interest of the country. This was communicated to Trotman who sits at the helm of the National Assembly which is regarded as the most important arm of the Parliament. The Speaker told Kaieteur News that Maharaj indicated to him that his organization is very much aware of what is going on in Guyana and will continue to keenly follow. between the Government and Opposition can be mounted once, of course, all stakeholders agree. The Speaker said that he recommended that the body send out an official statement to this effect. Trotman also told Kaieteur News that the OAS also contacted him and basically indicated similar willingness. He said that, that body also indicated that it is following what is going on in Guyana and queried if there is room for intervention. Trotman had written a letter urging the London-based Commonwealth Secretariat to intervene in the political crisis spurred by the President’s decision to suspend parliament. In his letter to Commonwealth Secretary General (SG) Kamalesh Sharma, Trotman requested that a delegation be sent to Guyana to engage the political Opposition and Government in breaking the political gridlock. “I invite you to send a delegation to Guyana to engage all sides of this disagreement so that this unhealthy situation may be brought to a speedy and peaceful end,” Trotman continued. 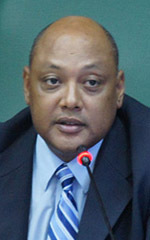 Though Guyana’s constitution gives the President the authority to prorogue Parliament, “the framers of our Constitution could never have intended that such authority would be used arbitrarily, or as a shield by a minority Government against the majority of the elected members of Parliament,” Trotman told the Commonwealth. During his recent appearance on the radio programme ‘Hard Talk’ aired on 90.1 Love FM, Trotman expressed his opinion that there should be dialogue and said that he thinks it is the only way to move forward. He believes that a mediator may assist in breaking the political gridlock. The passage of the No Confidence Motion would have seen Parliament being dissolved and the holding of General and Regional Elections.